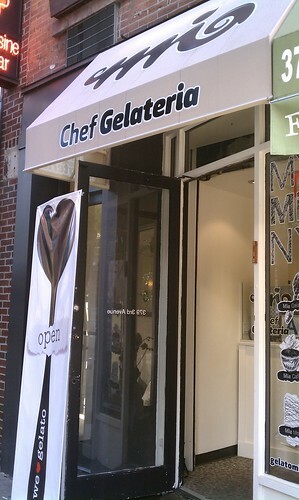 In an effort to soothe the resulting discomfort from Marcus's post-wisdom teeth removal, I decided to take him to Mia Chef Gelateria over by Kips Bay. I had heard about Mia via Grub Street, who brought attention to its incorporation of "classic" American flavors (but unusual compared to typical gelato offerings), highlighting its Cap'N Crunch creation. Now, this I had to see and taste! Along with really interesting gelato flavors, Mia also serves organic coffee and a Hungarian pastry (in three flavors) called kutosh, which is a hollow and cylindrical. The dough for the kutosh is made in-house, offered in the flavors of gianduja (i.e., hazelnut-chocolate blend), dulce de leche, and toffee. 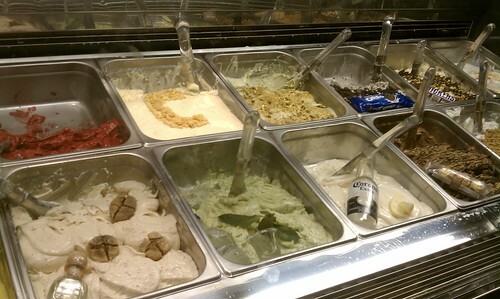 The gelatos are made fresh daily, using ingredients imported from Italy. The second one from the top left is the Cap'N Crunch (notice the "C"-shape made using Cap'N Crunch cereal bits), which Marcus jumped on ordering. The fourth from the bottom right is the Ferrero Rocher flavor, which is what I decided to order. Among the flavors offered while I was there included mango margarita (in honor of Cinco de Mayo), pistachio, Oreo, Snickers, Nutella, and some others). The Cap'N Crunch was as delicious as it sounded in theory (if not, more). Executing one of the classic American childhood cereals can certainly be a challenge, but Mia has certainly done right by the Cap'N himself! It captured the essence of those tiny sugary, sweetened corn-flavored squares submerged in a sea of milk, except there's no worry about the structural integrity of the cereal in milk or how quickly you have to eat all the cereal before it becomes all mushy and soggy (though, you can't eat too-too slowly for it will melt into gelato soup!). My Ferrero Rocher gelato was very nice as well, though there weren't as many chunks of chocolate-hazelnut goodness as I would've liked. 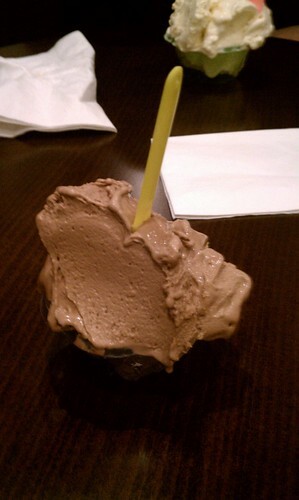 Nevertheless, the chocolate pieces I did manage to scoop up went amazingly with the chocolate base of the gelato. 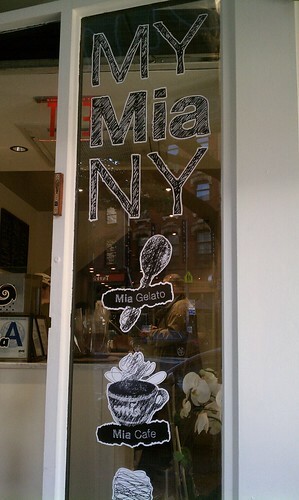 Findings: I really enjoyed our detour to Mia Chef Gelateria. 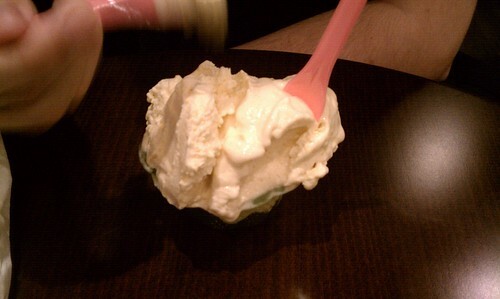 The Cap'N Crunch gelato is, hands down, one of the best scoops of gelato I've ever had (and certainly one of the most original)! The Ferrero Rocher was also enjoyable, but for my next visit (and boy, will there be many), I hope to try the Cinnamon Toast Crunch (yes, another to go with the American childhood cereal theme), Snickers, and pistachio as well as for the kutosh, which I saw samples for but was unsure of what it actually was, until I reread the Grub Street article (mentioned at the beginning). Marcus said he would kind of like to do what we did at Madeleine Patisserie (now called La Maison du Macaron)--you know, that time we spontaneously decided to buy a box of 20-ish macarons for $50 so we could "try" all of the flavors. Not sure if my stomach could handle that much dairy or that much sweetness in one sitting, but as a consolation, Mia does offer you samples of any flavors you wish to try, so maybe we could do that instead! I'd also like the note the two individuals behind the counter were super helpful and so kind to us and all of the customers that were coming in and out of the gelateria. They certainly made us more excited and extremely welcome in the new café--great job on service! So if there's anything you take from this post, the Cap'N Crunch is a must-order--I promise you'll be thanking me through your last bite. Price point: $4.50 for a small cup of gelato, $6.25 for a large.